Toronto (HAN) May 8, 2014. A Somali-Canadian youth on trial in Toronto for allegedly attempting to join Al-Shabab was questioned Tuesday about his relationship with two former Somali-Canadian classmates who left for Somalia in 2009 to take up arms with the Al-Shabaab terrorist group in Somalia against Ethiopian forces and killed. Mohamed Hersi acknowledged knowing Mohamed Elmi Ibrahim, alias “Canlish,” from high school and the University of Toronto, and said he had visited the family home to pay his respects after the youth was killed in Mogadishu. “I probably should have called, but he wasn’t saying he wanted to do anything in Canada. I was like, out of sight, out of mind. 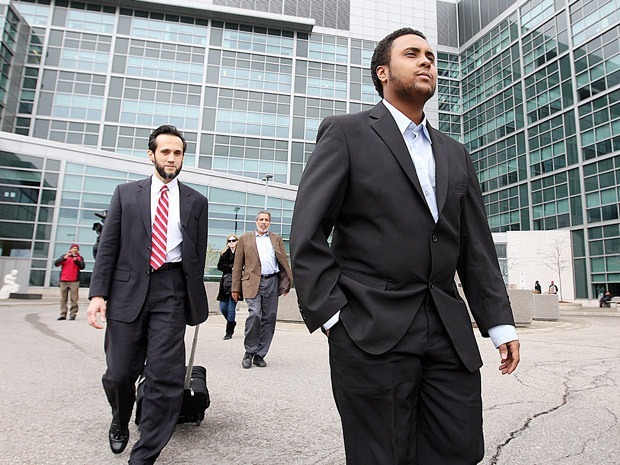 In hindsight I probably should have reported him,” Mr. Hersi said. Somali-Canadian Mohamed Elmi Ibrahim was reportedly killed in Somalia while he was fighting as a member of terrorist group al-Shabab. Mohamed Hersi also confirmed he had known “Casanyo” Abdurahman from Winston Churchill Collegiate Institute and his mosque, and said he accepted a Facebook friend request from him despite suspecting he was at an Al-Shabab camp. “In Toronto, when I knew these guys they were hard-working, studious, good to their mothers,” Mr. Hersi said. But he said he had not communicated with them since they departed Toronto and he denied any intention to follow in their footsteps.